Ribbon pasta, which is flat strands of pasta, is available in different lengths, widths and thickness. Some are short and wide, while others are long and narrow. 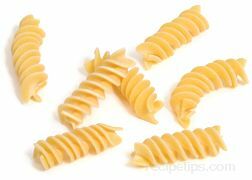 Ribbon pasta can have straight or wavy edges and many varieties are available fresh and dried. The dried ribbons are generally used with a thick, heavier sauce and the fresh ribbons are served with a more delicate sauce. Bavette A long, flat, narrow ribbon pasta that is similar to tagliatelle, only narrower. Cook for 6 to 9 minutes. A narrower version of bavette. Cook for 5 to 8 minutes. A long, flat, wide pasta noodle, which is approximately 3/8 inch wide. It is generally an egg noodle. Cook for 8 to 10 minutes. A thinner version of fettuce. Fettuccine is approximately ¼ inch wide. They are sold in loosely coiled nests and in flat strands approximately 10 inches long. Cooking Time: Cook for 7 to 10 minutes. The thinnest version of fettuce. It is approximately 1/8 inch wide and is most often sold as straight sticks. Cooking Time: Cook for 6 to 8 minutes. A narrow egg noodle that varies in length anywhere from 1 inch to 4 inches. It is a dried pasta that closely resembles homemade noodles. It is thicker than other commercially dried pastas. Cook for 9 to 12 minutes. A very wide flat pasta that is available in ribbons that are approximately 10 to 13 inches long and vary in width from 2 to 3 ½ inches. Lasagne is also available in sheets that are generally 3 ½ x 5 inches or 4 x 6 inches. The ribbons or sheets are layered in a casserole between other ingredients to make a dish called lasagne. Lasagne is available in several different styles. Some varieties of the noodles have straight edges and some have wavy edges on one or both sides. Some lasagne sheets have waves throughout the entire sheet running parallel to its length. There is also a variety of lasagne noodles available that do not require precooking. Cooking Time: Cook for 11 to 13 minutes. Do not precook "no-boil" variety. Lasagnette A narrower version of the long lasagne noodle. It is found with wavy edges on both sides, on one side, or having straight cut edges on both sides. 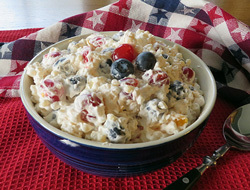 It can be used in a baked casserole dish or it can also be just boiled and served with a sauce. It is very similar to mafaldine and riccia. Cook for 10 to 12 minutes. A ribbon pasta that is basically the same as lasagnette, only longer in length. It is used in the same manner as lasagnette. Cooking Time: Cook for 11 to 13 minutes. A narrower version of linguine. 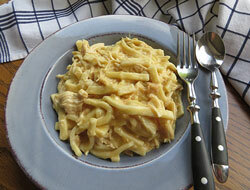 It is also found named linguette fini. Cooking Time: Cook for 5 to 8 minutes. Spaghetti-like pasta that has been flattened into oval-shaped or flattened ribbon pasta. Linguine is approximately 1/8 inch wide. In Italian, linguine means little tongues. Cooking Time: Cook for 6 to 9 minutes. 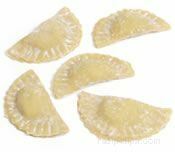 Mafalde - A flat wide ribbon pasta that is approximately ½ to ¾ inch in width and has rippled edges on both sides. 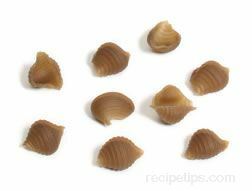 This pasta is found both in short lengths of about 1 ¼ inches and long lengths of 10 inches or more. Cook for 9 to 12 minutes. A flat ribbon pasta that is a slightly narrower version of the long variety of mafalde. It is approximately ½ inch in width and like mafalde it can have a rippled edge on one or both sides. 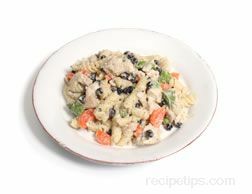 It is sometimes referred to as riccia and is very similar to lasagnette. 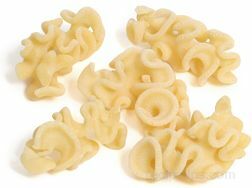 A wide flat ribbon pasta that is approximately 5/8 to 1 inch in width. It is available with straight edges or rippled edges. Sometimes spelled papparedelle. Cook for 7 to 10 minutes. Pillus Very thin ribbons of pasta. Cook for 5 to 8 minutes. Thick, flat noodles made from buckwheat. They are generally a long noodle sold in nests but are also found cut in short lengths. Cook for 10 to 14 minutes. Reginette Wide, flat ribbon pasta that has rippled edges on both sides. Reginette is similar to lasangette. 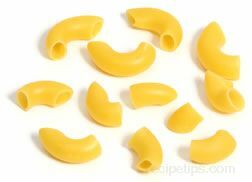 This wide flat pasta is also found named reginelle. Cook for 7 to 10 minutes. A flat ribbon pasta that is very similar to lasagnette. It is approximately ½ inch in width and can have a rippled edge on one or both sides. 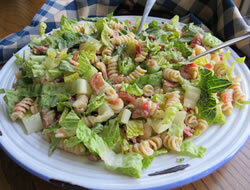 It is sometimes referred to as mafaldine. 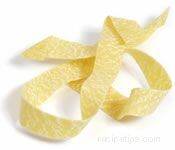 A short, flat pasta ribbon, which is approximately 1 ¾ to 2 inches in length with fluted edges on all sides. Cook for 9 to 12 minutes. Stringozzi Narrow Umbrian pasta ribbons that are thicker than spaghetti and look similar to shoestrings. The thickness of this pasta provides for a chewier texture. Cook for 11 to 14 minutes. Long thin, ribbon pasta that is generally found ¼ to 3/8 inch in width. It can be made with or without eggs and is available in straight strands or coiled in a nest. A wide, flat ribbon pasta that has one rippled edge and one straight edge. They are available in straight strands or coiled in a nest. Cook for 7 to 11 minutes.